"What’s the trick I so wish to know, to impress my beloved and make him/her fall more in love", exclaimed by all the people who are in love (the survey is empirical but real). The most beautiful thing in this whole world cannot be heard or seen, but felt with the heart and soul. Loving someone from the bottom of the heart is one heartwarming thing and showing it with exact intensity is another cool thing. Searching for new ways of falling in love with him/her? Finding romantic gifts for him/her that will speak your heart out? Looking for a spellbound surprise? Take your better half through that ineffable journey again and express your incredible romance in style with premium quality personalized photo albums. Days, Months, Years and Decades- How has your ageless romance grown? Create, print, preserve, relive, and repeat – make your own photo book to see the biggest blushes and larger-than-life smiles of your beloved. I feel like flying when I'm in that lovely zone, often getting adrenaline’s call. It creates happy illusion; every single moment feels bliss bound. To enjoy all the ecstatic moments again and again and…. 5 or 10 years down the line, your adorable couple photo albums holding your happy moments would be one of the very few things which will remind you of the heavenly times you had when an invisible guest ‘love’ entered your heart. Don’t opt for a local album maker and waste too much time in collecting your photos, visiting shop and follow their terms. 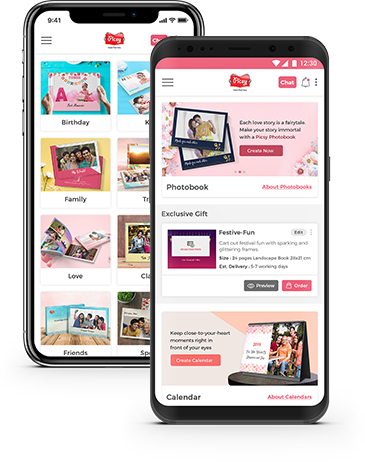 Make couple photo albums with Picsy app hassle-free whenever you want, do as many changes you want, design and preview at your convenience and order wherever you wish (Delivery across India is free, just saying :p). Go get Picsy app to create photo books online and touch your special memories offline. Note: It is advisable to keep tissue papers with you when you are flipping Picsy Personalized Photo Book Pages. We bring happy tears; we are proud of it.